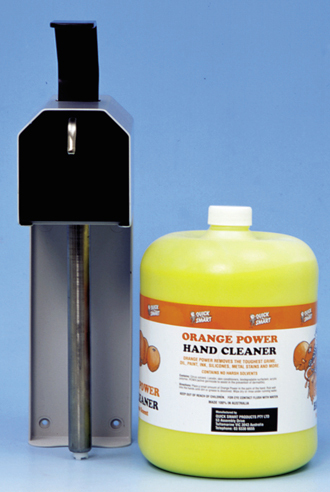 Quick Smart Products stock a variety of industrial hand cleaner dispensers and pumps suitable for use with our range of hand cleaners to assist in minimizing wastage. 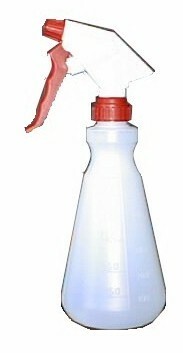 All hand cleaners are available in the easy to use AR100 wall dispenser which takes a 4.5 litre jug. The dispenser can be operated by hand, forearm or elbow. The robust housing is made of anodised aluminium. Installation is easy and secure using the four screws and plugs provided. The AR100 is the ideal dispenser for industrial purposes, suitable for all high usage environments. 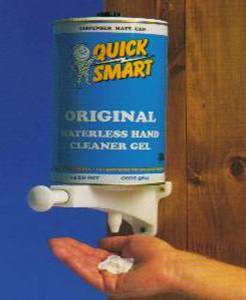 The clean and efficient alternative to all your hand cleaning needs. These dispensers have a rugged plastic construction with stainless steel working parts. Pumps stiff hand cleaner gels with or without pumice. One hand push operation makes the dispenser easy to use. They are fully guaranteed for five years with non corrosive plastic and stainless steel parts. 2.5kg refills are available in 3 formulas: Quick Smart Gel, Supa Grit and Orange Power.